Meet one of the canine survivors of the great Titanic disaster! It was the newest, sleekest, most deluxe ship in the White Star fleet—and the steamship company boasted that it was guaranteed unsinkable. They called it the Millionaire Special because, on its historic maiden voyage from Europe to New York, the RMS Titanic listed among its passengers some of the wealthiest people in the world. And where there are millionaires, there are bound to be pampered pups—eleven of them, by most accounts. This is the story of one of the survivors, a Pekingese named Sunny. Sunny was the canine companion of the glamorous globe-trotters Henry Harper and his wife Myra. Along with Hammad Hasat, their Egyptian man-servant, he boarded the Titanic on April, 10, 1912, little knowing that the mighty ship was on a collision course with a massive iceberg. 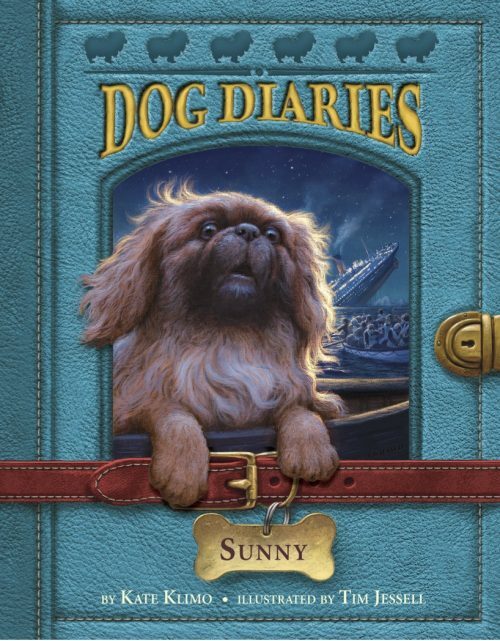 During the all-t00-brief voyage, Sunny makes friends with the other dogs in the ship’s kennel and gets well acquainted with the aptly named Poop Deck. He also bonds with a young boy from steerage, who takes him on a grand tour of the ship, from the lifeboat deck to the engine rooms, and gives him a new appreciation for how the less fortunate classes live. But no one on board, crew or passengers, whatever their class, is aware of the deadly danger that awaits a mere three days into the voyage. When the Titanic collides with the iceberg, within hours the unsinkable ship breaks apart and sinks to the bottom of the sea. Of the 2, 229 passenger and crew on board, only 713 survived the sinking. Of the ll dogs, only three lived: Sunny and two Pomeranians. It is probably no accident that the three canine survivors were all lap-dogs, easily smuggled on board the lifeboats. Here is Sunny’s gripping account of the days leading up to the collision and the subsequent rescue of the survivors of one of the great maritime disasters of all time. Everyone said it was unsinkable. The Titanic was the newest, sleekest most deluxe ship in the White Star fleet and on its historic maiden voyage from Europe to New York. There were so many wealthy people on board, they called it The Millionaire’s Special. And where there are millionaires, there are bound to be some pampered pooches, eleven, to be exact.